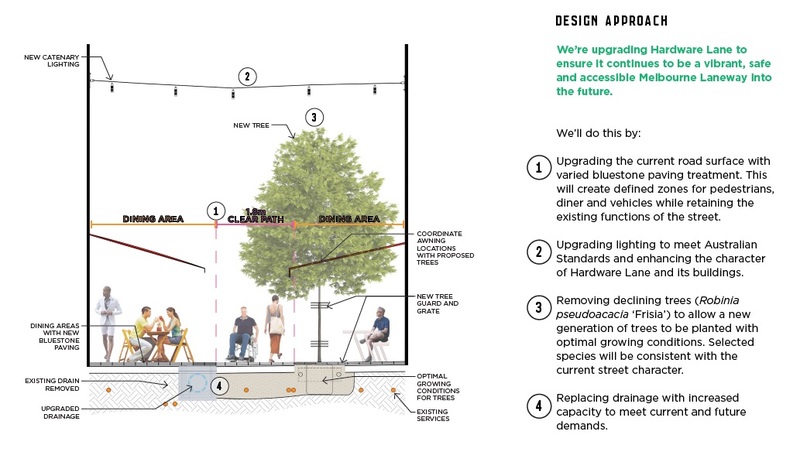 We’re planning works to upgrade Hardware Lane, maintaining its status as a destination laneway. Hardware Lane is one of Melbourne’s most loved laneway destinations. The planned improvements will maintain the laneway's unique charm and attract more visitors to the space. Works required include upgrading the existing road surface with bluestone pavers, renewing and upgrading drainage, improving lighting, replacing existing trees and increasing the number of trees. We’d like to know what you think of the concept plan before we develop a more detailed design. What are the proposed upgrades? The road surface needs to be replaced, as it was last updated over 30 years ago. Drainage needs to be renewed and upgraded. This involves replacing sections that may be damaged, and increasing existing capacity to reduce flooding in the Elizabeth Street area. Lighting needs to be upgraded to ensure that lighting levels are kept to Australian Standards. This will also improve ambience and safety of the area. The existing trees have been assessed and need to be replaced. There is also an opportunity to plant more trees, which will increase canopy cover and enhance the leafy environment of Hardware Lane. When will know if the project will go ahead? We’ll use your feedback to develop a more detailed design for Hardware Lane. This will be used to request funding for the project. Funding for the project will be confirmed in mid-2019. If the project is funded, works are expected to start in 2020. Works will be done in stages and we need your feedback to tell us what time of year is best to undertake the work. Will I have to close my business when works take place? Pedestrian access to businesses will be maintained while works are taking place. If you have an outdoor café area, there may be some temporary disruption to your outdoor seating area while works are undertaken. We will do our best to minimise disruption and will work with you when we develop our schedule to make sure we understand your business operations.